Additions, updates and deletions to the classifieds can be sent to: bluejayclass@gmail.com . 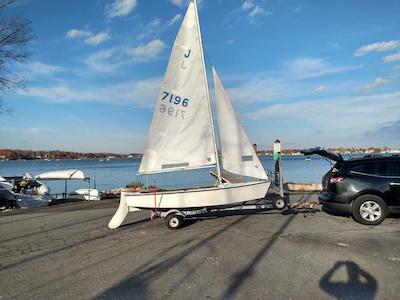 2/17/2018 For Sale: Main sail and jib, fair condition, $120. Mast (no rigging), $120. Email John at baybreeze2@yahoo.com. located in Jamestown, RI. 11/19/17 For Sale: 2000 Blue Jay, hull 7202. Very good condition. This is probably one of the newer ones made. It is all fiberglass with no wood. Comes with Spinnaker and all the typical accessories+ a trailer. Originally bought from Charles Dufresne of Greenwich CT several months ago. He failed to mention some issues. I had to reseal the top of the centerboard housing, clean the sails and fix part of the trailer. I have tested it 4 times to make sure it is solid. It sails well however It is a trainer boat for teens and a daysailer for 2 adults. I was looking something with higher performance like a Lightning which is far more expensive. It's an attractive and classic boat that will teach you how to sail. $1900. Contact Peter at 703 861 0289 evenings. I'm in Northern VA and travel to NY periodically. 7/16/2017 Wanted: I am looking to find the whereabouts of Blue Jay #4283. I built this vessel in 1965 from a "Roberts Kit", and sailed on the North Shore of Long Island for several years. The ship was sold in September1969 in Warwick, RI through Dickerson Bros at Appanaug Marina (current name). Please contact me at Anthony_Ganz@yahoo.com. Thank you. 1/9/2017 Looking for a wooden Blue Jay with the sail number 4470. It was built by my father in the late 60's. The top was painted a robin's egg blue, the splash & side rails, as well as the flooring and mast were all varnished wood. It was sold to an older man in 1975 when we left Reading, PA. I am hoping that someone is interested in selling it. If anyone has information about this boat, please contact Karen at ptsmom20@gmail.com. 8/22/2016 Need help! Looking for previous owners of hull number 6850. I recently bought the boat from a guy in New Jersey but he had no paperwork. He got it from a family who had bought it for their daughter some years ago. That family had bought if from someone in Massachusetts. I need a paper trail of ownership so I can register it in New Jersey. Boat was made by Formula Yachts, Inc in Noank, Connecticut. Please contact Henry Kerwien, hkerwien@yahoo.com or 973-919-8873. 6/26/16 FOR SALE: 1999 Blue Jay in good condition complete with sails, including Magic Tilt trailer, asking $1,000. Please contact Larry and Donna Stein (631) 239-1149, located in Centerport, Long Island, NY. 6/17/15 Wanted: Set of Blue Jay sails. Please contact Will in New York at William.stone74@gmail.com.